If you want to make yourself offline on Facebook? 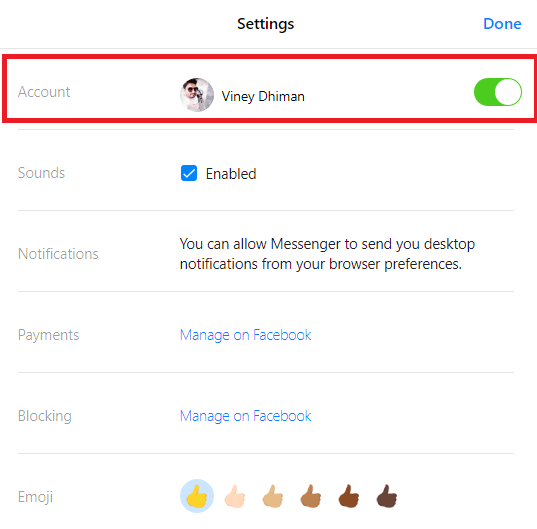 The following post has step by step instructions on how to appear offline on Facebook Messenger. When you appear online on Facebook, it is a signal to your friends that you’re free and ready to chat with them. But that is not the case all the time; sometimes users might be sleeping, studying, riding a bike, and doing other stuff. Sometimes you’re online, but not in a condition to reply your friend’s messages. Even situation become worst when you start receiving messages from the users to whom you don’t want to talk, and those friends are in a position that you can’t even block or unfriend them. In all the discussed cases it is a good idea to appear offline when you’re busy or go offline for a particular user to whom you won’t want to talk. The good thing is there is an option using which users can go invisible to Facebook friends or appear offline to specific friends. But the question is how? With the help of this post, I decided to guide you all the step by step instructions on how to appear offline on Facebook for various platforms. 1. First of all visit Facebook.com. 2. Click on the ‘Options’ (Gear icon) available on the Chat section which is available on the bottom right side of the screen. Select this option if you want to appear invisible for all Facebook select. When this option is selected, the friend’s list will blur out, but you still be able to send messages to any of your friends on Facebook. Select this option if you just want to appear online to limited Facebook friends. This will show you the area where you can type the name of the friend. 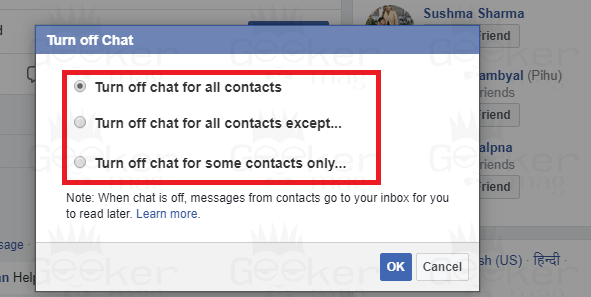 Select this option if you want to appear offline to limited Facebook friends. Again this will show you the area where you can type the name of the friends. You can select the options according to your requirements. With the help of this method, you can make yourself invisible on Facebook right from the original Facebook web version. 1. Visit Messenger.com, and this will launch the standalone web version of the Facebook messenger. 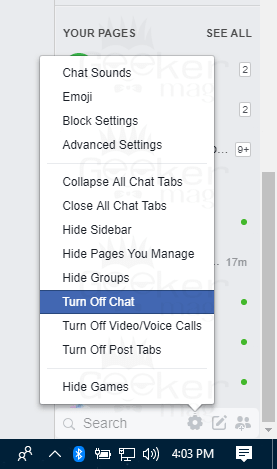 Alternatively, you can also open messenger right from Facebook. 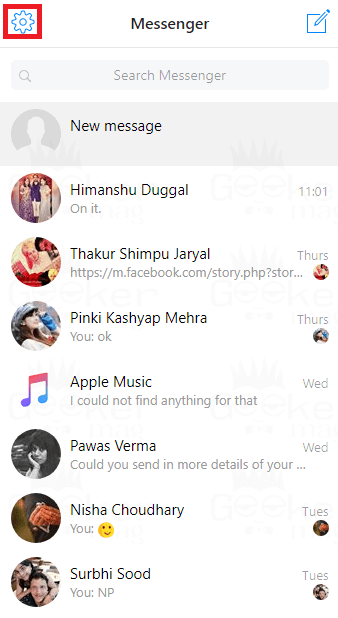 For that, you need to click on the ‘Messenger‘ icon available on the top left side of the Facebook timeline. 2. 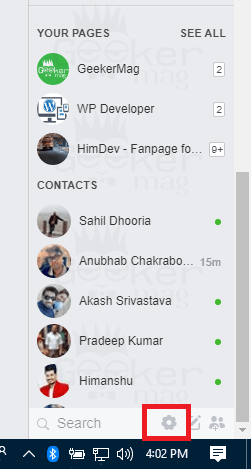 In the messenger windows, you need to click on the ‘Settings‘ icon available on the top left side of the screen. 3. From the menu either click on the ‘Settings‘ or ‘Active contact‘ option. 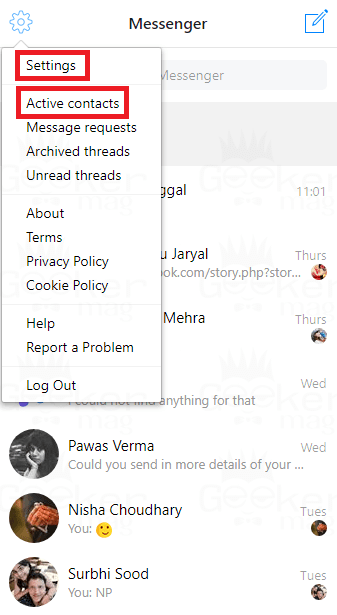 If you click ‘Settings‘ option, then you need to use the toggle button next to Account to go offline. This will make your account offline. 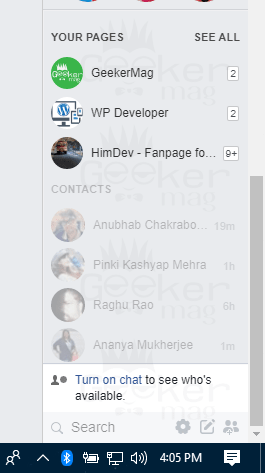 If you click ‘Active contact‘ option, then you need to use the toggle button next to the profile name. This will make you offline to all the active contacts. 1. Launch the ‘Messenger‘ app. 2. Tap on the ‘Profile photo‘ available on the top right side of the screen. 3. Here in this window, you need to tap on the ‘Availability‘. 4. In the new window, you need to move the toggle button to turn off the availability. A dialog will appear with the message which reads “Tun off availability? You won’t be able to see when your friends are active if you stop sowing when you are active“. Keep in mind: As of writing this blog post this method is working flawlessly, but I won’t guarantee that it will work so long. It because Facebook is regularly changing the way to access particular settings. Note 1: Sometimes even you turn your chat off, it takes few minutes to go offline completely. 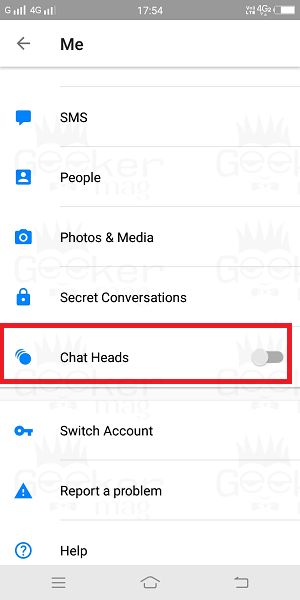 Note 2: In case, you have turned off chats on Facebook Messenger on Android phone, but you’re active on the Facebook web version of Messenger web version, then you still appear online. Note 3: The above steps will only work if you have currently logged into your Facebook account on one account. 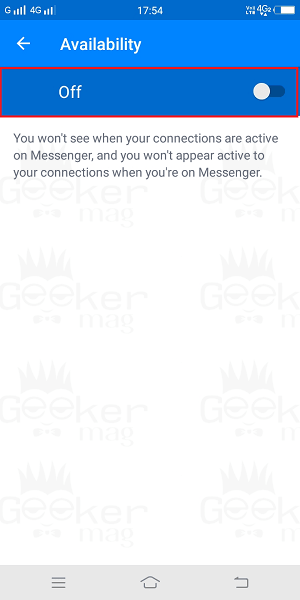 You might love to read about how to log out of Facebook Messenger. 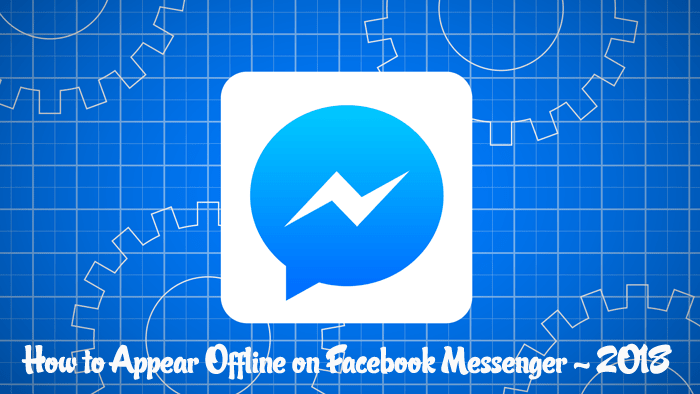 I hope you find my post on how to appear offline on Facebook Messenger. Let me know your thoughts in the comments.